Echinops ritro 'Baby Globes' is a unique compact form of the globe thistle. 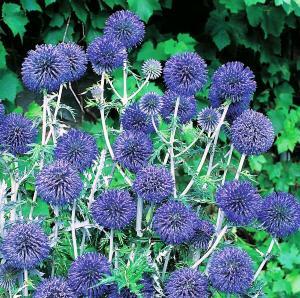 Brilliant architectural plant with amazing steel blue flowers in July-September. Outstanding for fresh or dried flower arranging, and one of the best Bee Friendly plants available. Pretty deeply cut Grey-green leaves. Prefers full or partial sun and well drained soil. Hardy. Height 60cm. Supplied in a 9cm pot.